"Bender's Game Part 2" is the eighty-second episode of Futurama, the tenth of the fifth production season, the tenth of the sixth broadcast season and the second cut from Bender's Game. It aired on 26 April, 2009, on Comedy Central. With the crew curious as to why the Professor is so upset about the ordeal, the Professor reveals that while he was working for Mom for the third time (having twice realized how evil she is and vowing never to work for her again), he was experimenting with dark matter which, at the time, was a completely useless substance. Placing several balls in a particle accelerator, the experiment produced a red, glowing energy crystal which turned all dark matter in existence into fuel. He presented it to Mom, who promptly decided to get back together with her ex-husband Wernstrom and took the crystal for herself, firing Farnsworth. Farnsworth adds that, at the same time as the energy crystal, he produced an opposite crystal which he kept hidden from Mom. He explains that if the two crystals should come in close-enough range with each other, their effects on dark matter would negate, rendering dark matter useless and allowing scientists to care enough to produce new fuel, as well as ruining Mom's dark matter empire. However, he now believes the anti-crystal to be lost forever, little realizing that it was found and is currently being used by Cubert and Dwight as a 12-sided die in their Dungeons & Dragons game. See Miscellany of Bender's Game. for trivia, goofs, etc. 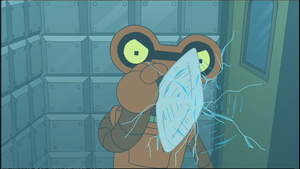 After the start of the introduction and a new caption, Roberto says "previously on Futurama" then stabs the camera in his cell in the HAL Institute before the recap begins. The establishing shot of Dr. Perceptron's door is replaced by the previous films ending shot of the HAL Institute. Perceptron simply says "Commence theorapy" rather than starting with "I understand." or asking about his feelings. The part where the mallet hitting Bender's head speeds up is cut. Leela doesn't say "come on" when encouraging the group to attack Mom. Farnsworth doesn't sigh before admitting to having lost the crystal, and Hermes' response doesn't include "well". Bender after saying the group needs to accept their problem doesn't say "And if we ever wanna get out of here, the first step is to admit it." Perceptron doesn't say "Now stop. Hammer time." Mad Hatterbot doesn't say "change places" for a second time. During Cubert and Dwight's mature argument, Dwight doesn't start a retort with "Yeah?" Larry doesn't say "I don't know, Walt." before getting hit. Cubert doesn't explain to the "exterminators" what his group is doing. Perceptron doesn't say "Diagnosis, insanity." The amount of laughing between Mom, Walt and Larry is reduced. After Leela sees the real Nibbler he poops some dark matter that rolls towards the screen before "to be continued..." appears, this pooping scene comes from later in the film. This page was last edited on 2 September 2013, at 00:18.